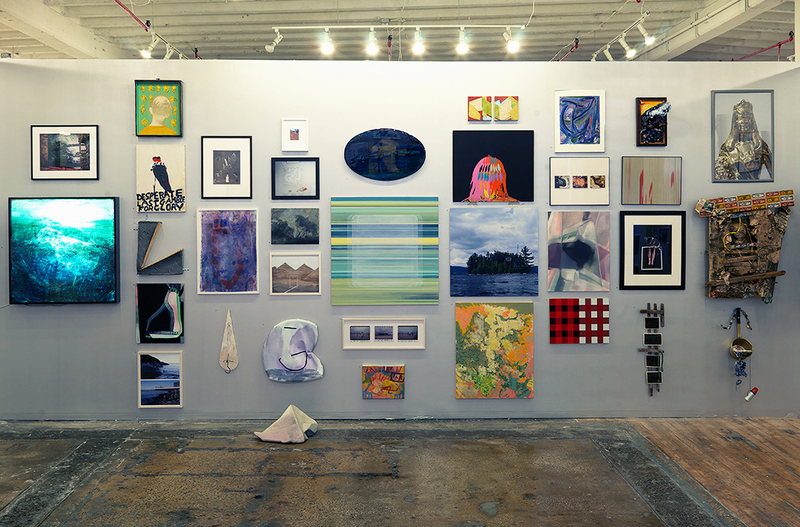 “The Beauty of Friends Coming Together II.” Installation view. Photo by Brian Buckley. 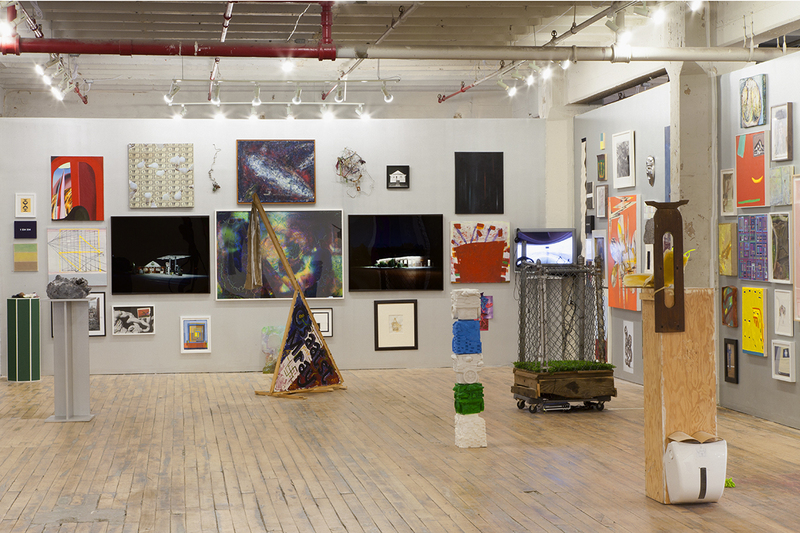 The Beauty of Friends Coming Together was a group show of Herculean proportions: nearly 200 artists on twelve walls. 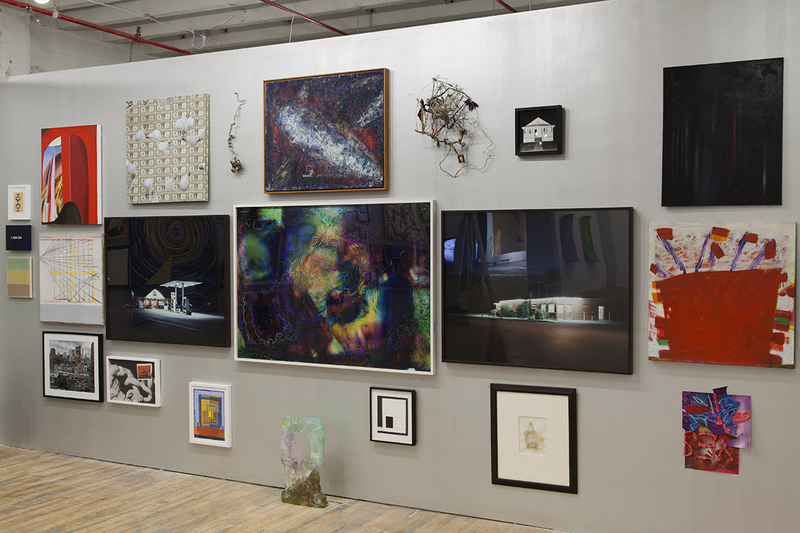 Within the already massive exhibition Come Together: Surviving Sandy, Year 1, it was not merely the logistical challenges that filled these rooms with vitality. It was the message, heard loud and clear across the two floors, that art making in New York City remains full of eclecticism and passion. In retrospect, it seems that perhaps only a tragedy of such proportions as Hurricane Sandy could have brought about such a joyous and varied surge of creative renewal. 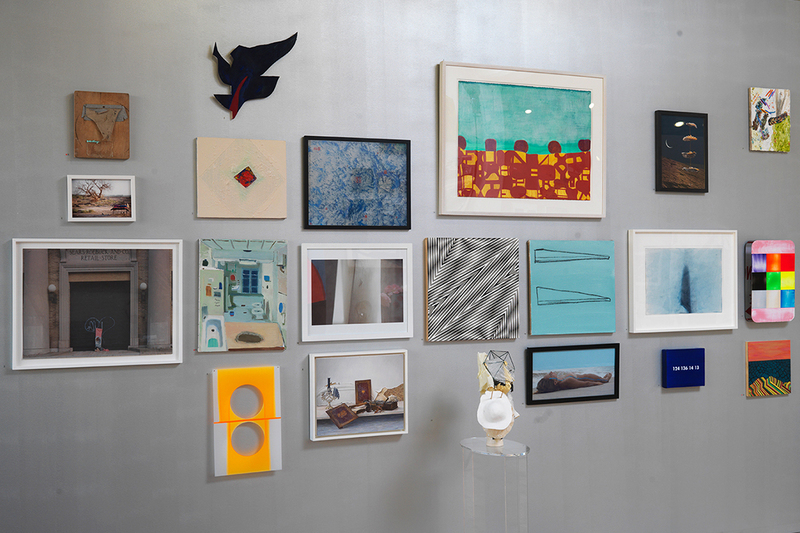 The concept for The Beauty of Friends was simple: one hundred artists, the majority of whom had been affected by the storm, were invited to submit a single, self-selected work. Each artist was then instructed to invite a friend, doubling the total count of participants. If a chosen artist was not directly affected by Sandy, he or she had to find a partner with a Sandy story, and vice versa. The exercise was a bit like finding a buddy in grade school, and became yet another way of building a sense of community. Bushwick artists found partners in Queens, veteran artists with stories of heartbreaking loss paired up with those fresh to the city’s landscape. Such an intertwining web across the boroughs generated an infectious exuberance, visible in the hanging of the show upon shimmering, silver walls. In gathering together the many artists for The Beauty of Friends, a second, regenerative, wave of Sandy stories was created. Stories that, we now hope, might enrich and outlast the initial accounts of great ruin. In gathering together the many artists for The Beauty of Friends, a second, regenerative, wave of Sandy stories was created. Stories that, we now hope, might enrich and outlast the initial accounts of great ruin. Creating expansive networks of people and their art is a drive that runs through Phong Bui’s veins. His way of “networking” differs from the business or career-building connotation of the word, with its notions of upward mobility. Phong’s networks are strictly horizontal. Exchanges are interdisciplinary and intergenerational; barriers of class and personal history are left in rubble. Indeed, this sort of network building is his lifeblood—his “social sculpture” as he would say. In its collective diversity, The Beauty of Friends was the manifestation of this spirit of exponential interconnectivity. 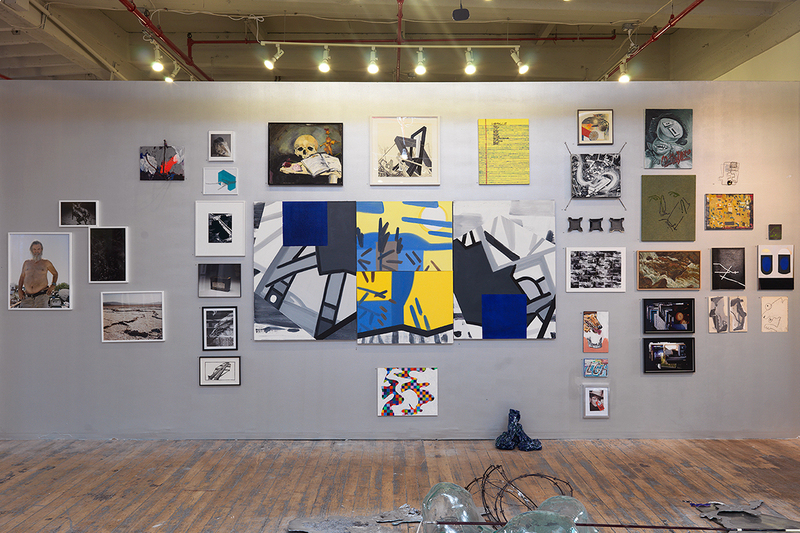 “The Beauty of Friends Coming Together I.” Installation view. Photo by Rachel Styer. 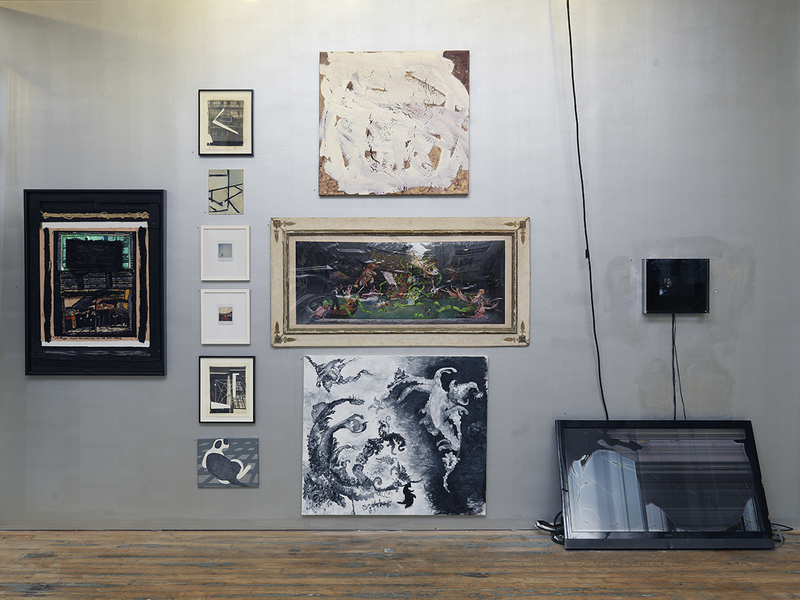 The work was split between two floors, and the range of media, style, subject matter, and maturity would have presented any experienced curator with a formidable challenge. But this was the brilliance of the show, because to walk through the galleries was to witness the multiple and varied voices that conveyed so much about what it means to live as an artist in this great city. Painted works representational and abstract, photography digital and analog, video choreographed and spontaneous, sculpture found and composed, and even site-specific installations were all merged into conversations both effusive and subtle. Here, the two partners in life became poles on the wall: one a mythical, jewel-toned telling of a soul adrift, the other, factoids of bare-knuckled perpetuity. Next door was Kristie Hirten’s Float, in which a closely cropped orange life preserver hovers near the painting’s surface, beneath a layer of dried hurricane detritus. The painting, which was lost for months after Hirten’s Long Island studio was submerged in the flood, was miraculously discovered a year later when the canvas washed up from the bay behind her family’s home, like weathered driftwood. In The Beauty of Friends, the painting hung valiantly on the wall with battle scars intact, still carrying the salty stench of the Atlantic. Another Sandy story could be gleaned from the work of Arnold Wechsler, an eighty-four-year-old artist whose commitment to the show was steadfast. Wechsler, who has lived in the Westbeth Aritsts Community since the 1970s, lost a substantial portion of his life’s work when the waters of the Hudson rushed into the basement of the building. In spite of it all, Wechsler was a regular visitor to the exhibition, wandering the galleries and spreading his ebullient spirit. When joining the show, Wechsler found a partner in Zack Garlitos, a photographer whose association with the Brooklyn Rail goes back to his days as a high school-aged volunteer. Previously unknown to each other, the two became “buddies” when Wechsler’s cousin, the filmmaker Lynne Sachs, serendipitously stopped by Rail headquarters and shared Wechsler’s story of loss. For the exhibition, Garlitos submitted Abstraction #1, a piercing, black-and-white image of a shadow’s edge splayed across concrete steps—a quiet nod to Wechsler’s frenetic abstraction. Though far apart in age and practice, the two have since foraged a friendship, Garlitos profiling Wechsler in his ongoing photographic series of artists in their studios. Across the gallery hung the series Moving Through the Water of Other Bodies, by the photographic team Johnson Sarkissian (Robert Johnson and Katherine Sarkissian). Right after Hurricane Sandy hit, the two traveled to the New Jersey shore to document the destruction, but stayed for months when they saw the scale of the desolation. Their camera, the team explained, “became a platform from which the residents could release their anger, despair and disbelief.” All twenty images were saturated with rich color and exquisite, unforgiving details—details that revealed moments of individual tragedy that were, in the end, monumental in scale. Gandalf Gavan, “Breach,” 2013. Aluminum, neon, dimensions variable. As part of “Beauty of Friends Coming Together II.” Courtesy of the artist. Photo by Brian Buckley. Some artists chose to use material culled from the storm’s wreckage, picking up on nature’s push toward rebirth. Kevin Marin, a resident of Queens, gathered the wood and wire from his neighbor’s toppled fence and created Acre, a free-standing sculpture that encloses a small television screen. Looking over and down into the fenced-in square, a deceptive infomercial loops on the screen promising prepackaged land out West, riffing on the games that real estate prospectors play with rising water lines. What I am describing, of course, is only a miniscule portion of the work that was included in The Beauty of Friends. The abstract paintings of Williamson Brasfield, Gaby Collins-Fernandez, Nathlie Provosty, Joan Waltemath, and Benjamin Weber introduced a more formal, meditative element to the collection of works. 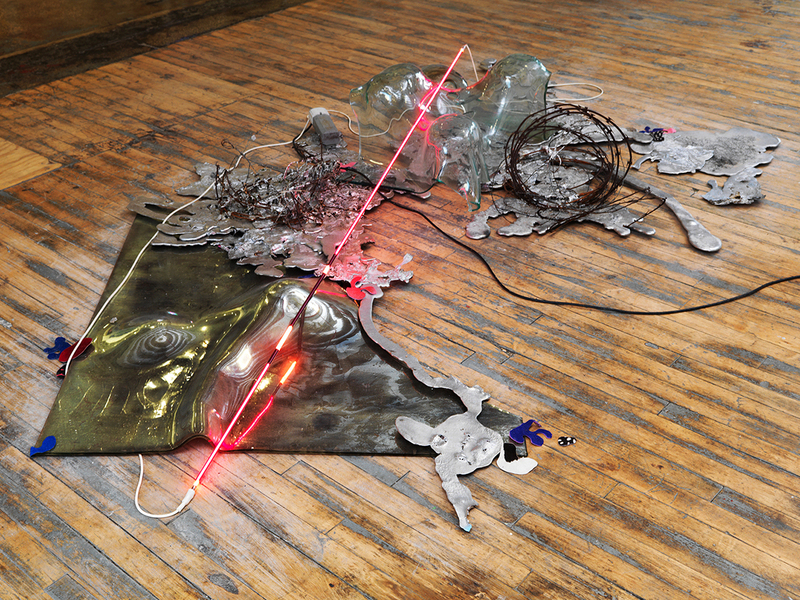 Meanwhile, the videos of Michael Marfione, Lucy Cottrell, and Kara Rooney spun narratives in entirely new, fantastical directions. The digital drawings of Nyeema Morgan scrambled words and traditions until obscured edits were all that remained, while the eerie, lustrous photographs of Wilmot Kidd reminded us that nostalgia always adds its own layer of glossy desire. Reflecting on the experience now, after the show has closed, I still remember arriving at Industry City early one September morning and hearing for the first time that we were adding another 200 artists to the show. (Naturally, I thought this was a joke.) Though involved with the Rail for years, I had joined the team only recently as the Managing Director—just as the exhibition barreled ahead. But as I saw time and again, the curatorial vision did not bend to difficult logistics, quite the opposite. Insurmountable tasks were navigated largely, if not entirely, because of a collective belief in this momentous opportunity. Phong Bui, and all the partners involved in the exhibition, believed that this was the time to reclaim Sandy’s legacy of devastation, our time to embody this moment of rebuilding. (“Refuse to use the word stress,” Phong would remind us in our morning meetings, “we must refer to such details simply as challenges.”) This sort of unflagging zeal, which began with the artists who picked themselves up after losing so much (Phong Bui being one himself), and trickled down from curator to staff, and later, to the thousands of visitors who traveled to witness the exhibition, is now, looking back, the most vivid manifestation of the resiliency Sandy inspired. It was about solidarity actualized through art. 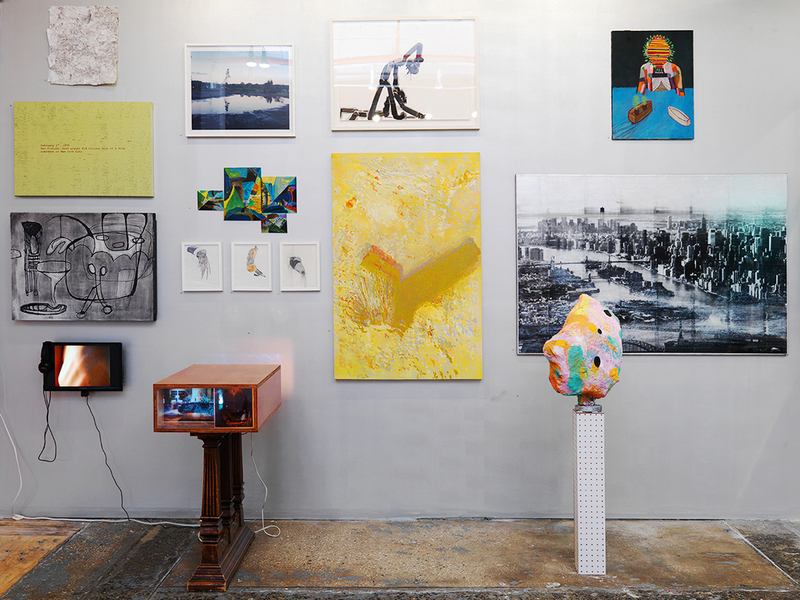 It is not often that you find instances of extreme democracy in the art world; rarely does establishing connections with other people—specifically with those different from you—ever seem to be the goal of an exhibition. But here, in this show, it was about nothing else. It was about people, the relationships they form, and the things they make in response to this inexplicable life. It was about solidarity actualized through art.